That feeling of togetherness is definitely a bond that turns a team into a champion. Extenuating circumstances kept the Crusaders from attending the Chuck Mound Girls Sports Awards/Soar-NJ.com event in December of 2013 in Randolph. 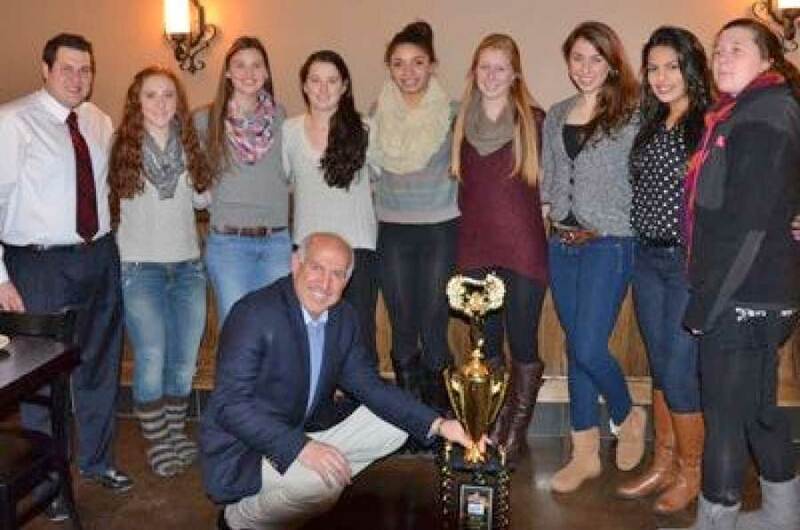 The event honored individuals and teams, including three of the best soccer squads in Morris County. The Randolph and West Morris soccer teams received honors that evening. On Wednesday, Jan. 22, a hardy group of Morris Catholic players braved frigid weather conditions and met at Ah Pizz, a new restaurant and pizzeria in the center of Denville, to accept a trophy for an outstanding season that culminated with the Non-Public B state title. The trophy, sponsored by the restaurant, will be displayed in the office of coach Andy Rotsides and brought out as incentive at the start of the fall 2014 season. The girls on the 16-5-1 team pointed to their togetherness as an important ingredient in their success. They overcame obstacles, including some disappointing losses, in order to play their best soccer near the end of the season. "We were really close this year," defender Charlotte Schum said. "Closer than we've ever been. There's really good chemisty between everyone. We worked really well together. "We got together a lot. We all hung out. We are all friends in school and out of school. Everything. Both on and off the field. We were there for each other. We are all friends." Morris Catholic lost several significant players. Among them was Morris County Player of the Year Tara Sobierajski. While she went on to a tremendous freshman season at Siena College, the Morris Catholic players had to decide how to replace all the things she did for them on the field. "It was definitely part of the process of going through the season," midfielder Rachel Mills said. "She did a lot of work last year. She scored a lot of goals and had a lot of assists. We basically had to spread everything out. We couldn't just leave it to one person." In the end, midfielder Taylor Shannahan was able to generate a lot of the offense. "It was an ongoing process but Taylor picked up that role really well," forward Jillian Sudo said. "In the beginning, it was really rough. In the end, the team really pulled it together." There were several setbacks during the year. The most notable was the loss to Kinnelon in the Morris County Tournament. It was after that 1-0 defeat that Morris Catholic turned its season around. "We all grew as a team that day," Shannahan said. "It was a big turning point in my mind. That loss was so pivotal. It was so important because we all wanted it so bad. From then on we just didn't want to feel that way again. We wanted to win and we wanted to rebound from that really bad loss. "We stuck together as a team. We worked even harder in practice. We practiced way more seriously. We listened to our coach. We had great coaching in the process after Kinnelon and we just stuck together." After the Kinnelon loss, the Crusaders went 8-1-1 the rest of the season. In state tournament play, Morris Catholic defeated Oak Knoll, Eastern Christian and Montclair Kimberley by a combined 9-1 score. It would be the second consecutive year Morris Catholic would play St. Rose in the title game at The College of New Jersey in Ewing. "We did our same things," Schum said. "Just our normal routine (before the final). We had to take it like it was just another game but know that there was a lot more emphasis on that game and we had to focus on everything." Goals by Shannahan and forwards Sam Garzon and Stella Johnson lifted Morris Catholic to a 3-1 victory. The contest was a thrill, especially for a player like Garzon who saw most of the 2012 title game from the sidelines. "It feels amazing (to win a state title)," Garzon said. "It still hasn't hit me yet. It still feels great. I look back at pictures. I relive that moment but it is still unbelievable that I was on that team." Now the legacy for this year's team is to challenge future editions to meet or surpass their success. Now they have a trophy to stand as a reminder. "It was a pretty big challenge (to repeat) but we were up to the task," Shannahan said. "We worked as hard as we could and we had the ability to make it. We always had that goal in our mind. We did it."